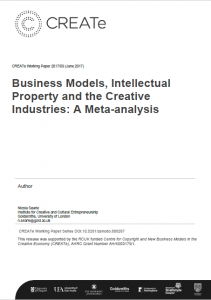 Grounded in the business model literature, this paper examines business models in the Creative Industries (CI), and the of role intellectual property (IP) following the UK’s 2011 Hargreaves Review of Intellectual Property. It does so via a meta-analysis of 20 research projects, including 80 case studies, on business models in the CI, with a focus on television, film, computer games and publishing. This paper probes the research to identify CI business models, and the interaction of IP and business models. The paper makes three contributions to the literature: one, it brings together the literature on business models in the CI with IP policy against a backdrop of technological change, two, it applies the Baden-Fuller (2016) business model taxonomy to the CI, and three, it performs the first meta-analysis of business models. The analysis suggests business models in digital era have remained remarkably stable, and the CI have actively lobbied to support existing models. The paper presents two methodological advances in the study of business models and the CI. First, it is the first CI study to adopt the Baden-Fuller (2016), four elemental business model taxonomy: product, solution, multi-sided triadic and matchmaker models. This framework focuses on the relationship between firms and customers, and is technology and process agnostic. This is supplemented by the Osterwalder & Pigneur (2010) Business Model Canvas, to provide a more granular understanding of changes in pricing mechanisms and value propositions. Studies of business models are dominated by qualitative, small sample studies, which suggests a systematic approach will lead to wider insights. The second contribution of this paper is applying the business model framework to qualitative meta-analysis. The scope of this analysis is limited to the studies in the Centre for Copyright and New Business Models in the Creative Economy (CREATe) at Glasgow University. This choice addresses challenges typically associated with qualitative meta-analyses by reducing variation in: chronology, definitions, populations, and the purpose of studies. The choice of studies, in which the author has been involved, also counters the common critique that researchers are unfamiliar with the studies (Stern and Harris, 1985). Following the reading of all abstracts, the population of 58 CREATe projects plus commissioned works was narrowed to 20 studies, resulting in 80 case studies. The paper also probes the Hargreaves era IP policy debates for the role of business models, industry and policy approaches to business models, and subsequent developments in copyright policy. The paper demonstrates that evidence that, in the years since policy discussions on business models intensified in the UK, the CI in the sample have chosen to lobby to secure a competitive advantage, but business models have remained stable. The vast majority of business models are categorised as product models, as they have been historically. Commissioned work, common in television production companies and independent games development studios, is the second most popular category of solution based business models. Commissioning is a ‘heritage’ business model in television, and has been adopted by the nascent computer games industry. Likewise, just as newspapers have traditionally operated with a multi-sided market, where users are readers and customers are advertisers, so do platforms (e.g. YouTube) and free-to-play games. This again suggests stability in business models. Finally, matchmaking models are found only in the retail side of the industry. There is, however, an important caveat to this finding in that end-user subscription services such as Spotify, represent the introduction of a solutions model to the consumer and account for an increasing proportion of revenues. However, the overall conclusion remains business models in the CI are relatively stable. However, changes are observed in pricing mechanisms and value propositions. In pricing, firms experiment with pay-as-you-go, freemium (free basic product, paid-for “premium” product), and others. Similarly, pricing mechanisms, combined with value propositions, have shifted towards more subscription models (e.g. streaming), as opposed to product sales. The business model framework adopted in this paper does not identify these changes as new business models; however a more colloquial definition of business models might. Outside the CREATe sample, subscription services like Spotify have combined new value propositions and delivery channels to launch new service models. Yet these changes are found in a minority of cases. The evidence for IP infringement as an impetus for business model change is scant. Both DoyleCR (2016) and Searle (2011, 2016CR) argue IP and copying concerns do not lead to changes in business models. Creators rely on alternative, non business-model strategies to protect against any negative impact of copyright infringement. The paper establishes lobbying as a preferred business strategy in the choice between business model and copyright changes. Overall, the picture is one of surprising business model stability, against a background of a concerted effort towards maintaining the status quo in copyright policy. While the digital era has transformed transaction costs, and production and distribution technologies, the CI largely rely on the same business model on which they have always relied: selling products and standardised services to customers.